The Life Fitness E1 Elliptical Trainer is ON SALE! Life Fitness produces some of the best machines in the industry. 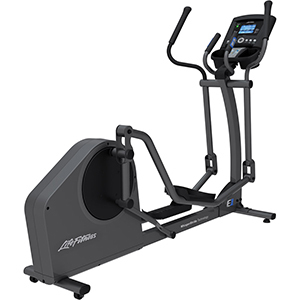 The E1 Elliptical combines smooth and natural motion with durability. It’s also extremely quiet! Life Fitness is well known in the fitness industry for creating extremely high quality machines. The company’s focus is on great ergonomic design and lasting components. Machines from Life Fitness will not have many fancy bells and whistles but you can be sure they’ll last. They often come at a pretty penny, so we urge you to consider your budget. Sometimes you can get similar specs from companies like NordicTrack or ProForm for much less money. Life Fitness E1 Elliptical Sale! The Life Fitness E1 Elliptical typicall sells for $2,199. The Life Fitness E1 Elliptical Cross Trainer comes with a choice of two console designs. The Go console is a basic LCD display with stats arranged on one window. 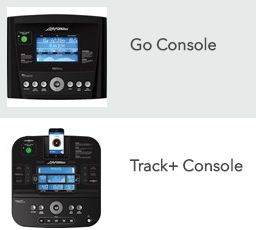 The Track+ Console display is compatible with Android and Apple devices. The E1 Elliptical comes with a 20″ stride length that will work for most people. It also has a near silent Whisper Stride. The machine is incredibly stable with a weight of 211 lbs and is rated to carry a user up to 400 lbs. It is a rear drive machine that provides a more natural and smooth elliptical motion. We like that you are given the choice of two different console designs for this machine. It lets you choose which level of technology you’d like and how much you’d like to spend. The E1 comes with three choices for the warranty. You can choose between the standard warranty, the 3 year extended package and the 5 year extended package. The Whisper Stride on this machine is pretty cool. It’s an almost silent machine! We wish that this machine had adjustable stride lengths. Yes, the 20″ stride will work well for many users, but it’s nice to adjust the stride according to the user’s height. This is a rear-drive machine so it can be a bit more difficult to mount for users with balance or mobility issues. You want a quality machine with great components. You don’t mind spending a little bit extra. You just want a quality workout without fancy virtual features. Also see the Life Fitness X5 Elliptical Review.